Tall and elegantly attired in full terno, she was a familiar figure on the campus of the pre-war University of the Philippines. 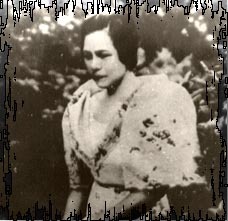 She was Paz Marquez Benitez, beloved mentor to the first generation of Filipino writers in English. Inspiring many students who later became literary luminaries, she had an enduring influence on the emergence and development of Philippine literature in English. Among ALIWW’s prized exhibits are the journals of Paz Marquez Benitez, which are inscribed in two hard-bound volumes. The entries, written by hand in both pencil and ink, date from 1924 and extend for an as yet undetermined number of years. Of special interest to literary scholars are her notes on the tentative plot and setting of her short story, “Dead Stars.” This story, first published in 1925 and regularly anthologized since, is considered the first modern short story written in English by a Filipino.